There are books I've been wanting to write about before, more in-depth, but a variety of circumstances didn't allow me to, at least until now. I therefore will take my time, in these last July's days, to post little updates that I hope you will find of interest. This morning I would like to shortly tell you about this text, that was published about a year ago already, by MeMo Publishers in Nantes, if you don't know them already I invite you to take a look at their amazing catalogue. 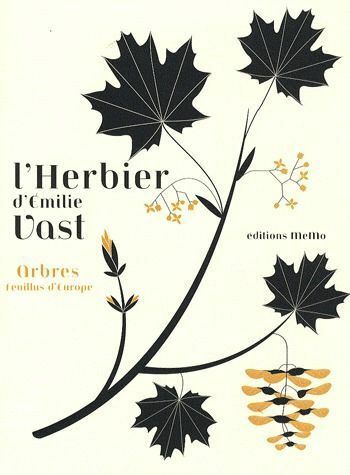 As the title already explains, this book is an Herbarium: a small compendium of medieval inspiration, even though it's not purely a scientific booklet, dedicated to European leaf trees. It's a little treasure of style, composition and graphics. On its double pages we can see: on the left the leaf's silhouette complete with its description, on the right a full page illustration showing the tree branch picturing the different stages from gem, to flower and fruit. The sober and elegant style recalls Japanese art, which reflects as well in the careful and delicate use of colour. It's a picture book where we can rediscover, together with more practical notions such as the use of wood obtained by the various trees, mythological anecdotes. The stories told are extremely short, no more than three lines, and they make you want to start searching old books about legends and myths. It's tales that make you ponder about all we loose every day, by taking the distance from nature and roots, no matter if it's the trees' roots or ours as they are inextricably tied the ones with the others, as this beautiful books makes us understand. What else can I tell you? The book has been published in Italian as well, last June, by Salani Publishing Company (if I'm not wrong). I have tried to find an English version but apparently there is none yet, please DO correct me if I'm wrong as I would be delighted to see it published in English as well. Same for Spanish!?! Hello Stel.la! How nice to hear from you again!!! Yes, it's an incredibly elegant and sophisticated book... I LOVED it!